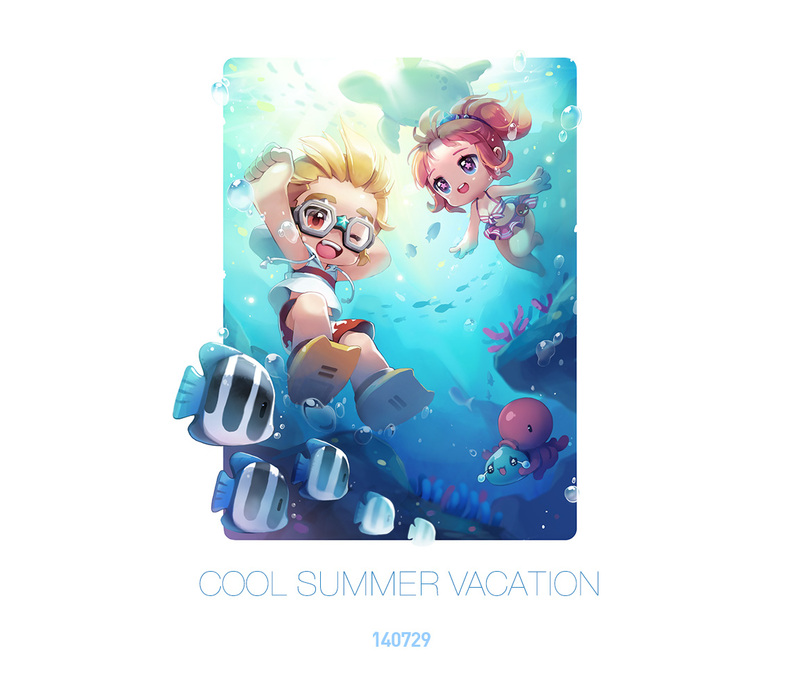 Home > MapleStory 2	> MapleStory 2 – Cool Summer Vacation! They released a new teaser image on the MapleStory 2 website, titled Cool Summer Vacation (click for a larger version). What is that octopus doing to that slime?! Also, GM Jackie from the MapleStory 2 team posted on the official Facebook page, with some new-ish information! We realized that in all of our current portal sites, there are many of you who are curious and would like us to explain a little bit more about the details of MapleStory 2. As we mentioned early on our teaser site, we are planning a non-subscription based charging system. We know everyone wants to play MapleStory 2 as soon as possible, and we are planning to open testing before December of this year. I would like to give you a more accurate and detailed schedule but if we were to reschedule, the users’ expectations would be big and you would be even more disappointed in us. Please understand that due to this, we can only give a general date. Finally, we have changed this portal site (Facebook) to allow you to ask us questions~! Okay, I don’t remember, but I’m almost certain that an NPC in an old quest described their taste. They said in an earlier post that they wanted to make ms2 the one thing ms1 wasnt, and that was a non pay to win game. (i dont know why they dont just fix it then…) but they said they were going to do everything they could to make sure it wasnt. so we could see a f2p model with just cosmetics and boosts. nothing like cubes and sht. Based on image, I think we can interact in the water. Also i’m not sure but it also shows some gameplay of somebody named “TonysKaiser” in a European English Private server called LucidMS? Df is with Koreans taking videos of English private servers? and i have no idea what it has to do with MS2.. They also have english text in MS2, even though most of it is korean. Any game in korean has English text. Koreans use english text for alot of things. I hope open beta is global and not just KMS :). Sorry to break it to you, but that is never going to happen. MS2 Is going to be in Korean, i kind of doubt that they’ll open MS2, considering Korea had updates and information released live in korea. And NA? I don’t remember hearing that from anywhere. Plus if you see all the games Nexon Korea own it pretty much topples over NA. Also i doubt they’ll be making the game in English either during beta. Sure, maybe it’ll come out one day for NA but not during Beta. Nexon has like what? 5 Games that are currently coming out in beta, including Maplestory 2? I don’t see anything like that for NA, they never even announced the game going out for other countries yet either. You should feel a tiny amount embarrassed that you couldn’t do this on your own. Ton of news outlets are reporting that the release will be global. MapleStory 2 Supporters’ Day #04: Contents! MapleStory 2 Supporters’ Day #03: Jobs!